After weeks of working cooperatively with a consultant to change the face of its school leadership, members of the Lycée Français de la Nouvelle-Orléans charter board on Monday voted against the wishes of a committee they assigned to recommend a full slate of new board members. Board members said yes to five new members — three unanimously — but their decision to talk about each candidate individually instead of approving the slate in one vote drew the ire of some onlookers who said the process upended weeks of progress that had set some parents’ minds at ease following more than a year of internal turmoil at the school. Only about 20 people attended the almost three-hour meeting, just a fraction of the number who have appeared at other Lycée board meetings over the last year as tensions escalated amid two CEO departures, financial difficulties and legal strife. Lycée parent Robert Bell said that’s because parents were under the impression that the board was turning a new page. Bell was one of five people who served on a nominating committee that whittled 31 applicants down to six last week through a process that included three nights of public interviews. “I am heartbroken that this is occurring,” Bell told the board. 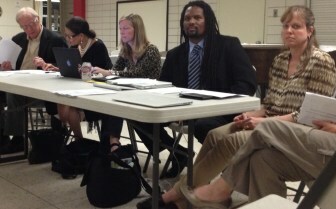 Lycee board members met Monday to decide who will replace them. They included, second from left, Dan Henderson, Jacqueline Simon, Paige Saleun, Jean Montes and Catherine MacPhaille. The nominating committee was created in March with the unanimous support of Lycée’s full board. A consultant hired for the school by the Louisiana Association of Public Charter Schools at the behest of state Superintendent John White recommended all members of the board resign June 30. If they wanted to continue to serve, they would have to reapply. Of the current board, only Lycée board chairman Jean Montes submitted an application. But the committee did not entertain even interviewing him. Monday, Montes voted against Jones, Castoriano and Gray. And though the names of the applicants — as well as their resumes — have been posted on The Lens numerous times since their release following a public meeting March 25, Montes said that Monday night’s meeting was the first time he’d heard of them. “I didn’t know their names until I got here,” he said. “There’s no excuse to say you didn’t know,” said parent Charles Varley during public comment. The atmosphere in the 340-student school’s cafeteria grew tense as the board voted to break up the recommend slate of candidates and review each individually. Some parents felt board members reneged on their previously approved process in which their replacements would be chosen with an all-or-nothing vote on the slate of recommended new members. Robert Rachal, an attorney representing a group of parents who earlier this year voiced a host of concerns related to the school’s governance, arrived midway through the meeting after monitoring board discussion through a live blog on Uptown Messenger. “You’re taking apart the work of the nominating committee,” Rachal told the board, objecting to its 4-1 decision to vote on the applicants individually. Catherine MacPhaille was the lone dissent. MacPhaille is also the only board member who served on the nominating committee. “We feel as a nominating committee that this is a strong group of candidates,” committee head Jeff Teague told the board as he presented the group Monday. MacPhaille made a motion to approve the slate and Dan Henderson seconded it, launching what would turn into two hours of discussion and procedural dispute. Many parents commented. Some said the process the committee followed was less than transparent, as it depended on a ranking system devised by the consultant, Jeremy Hunnewell and curtailed public deliberation. Others said the opposite. Mary Wanda Fandino, a parent, said the nominating committee’s work was rushed and she did not think “due diligence” was done in vetting candidates so quickly. Fandino alluded to Jones’ relationship with Grandiere without mentioning Jones by name: “My understanding is that they lived together for several years,” she said. Grandiere and Jones worked at the Lycée in San Francisco together, something Jones disclosed during the interviews last week. But Teague said that after he learned of parents’ continued concerns regarding Jones’ ties to former school leader Grandiere, he had a conversation with Jones on Sunday. Teague said Jones told him that Grandiere rented a room from her family for six months after he moved to New Orleans. Teague said he was satisfied with Jones’ ability to govern independently of that relationship. Grandiere resigned from Lycée in November after only a few months as the school’s leader. Board member and parent Paige Saleun Monday night said she was uncomfortable that Jones did not disclose the fact that their children had been in the same class at Audubon Charter School. Montes said he did not attend any of the interview sessions last week so as not to influence the work of the committee. Saleun, meanwhile, attended two, speaking out on Thursday night as the committee deliberated over what candidates they should recommend to the full board. Jeff Madison, a parent who also applied for the board, called for Montes to recuse himself from a vote on new members, but Montes did not. The board stumbled over procedure at times Monday. With MacPhaille’s original motion on the table to approve the slate, and Saleun’s amendment to change the motion to allow discussion of individual candidates, a parent spoke up against the amendment. The school’s attorney, Lee Reid, said he agreed with her and that the board should amend its agenda, not just MacPhaille’s motion. MacPhaille’s motion failed with a 2-3 vote. The board then decided with a two-thirds vote to amend its agenda and vote individually on the six candidates. Henderson at one point asked what the argument was for voting on a slate of candidates and MacPhaille said it was the board would not “nitpick” the work of the nominating committee. After the board amended the agenda, motions to approve individual members began. Henderson initiated all of them. Board members voted to approve both Castoriano and Gray by a vote of 3-2, with Montes and Saleun dissenting both times. Greenwald, Mills and Rhodes were each approved unanimously. After Henderson motioned for Jones, there was more board discussion. Saleun said she did not feel comfortable having Jones on the board. Parent Darren Beltz asked the board to consider that each nominating committee member had selected Jones in the vetting process. Members Henderson and MacPhaille advocated for Jones to be added. When Montes called for a vote, only Henderson and MacPhaille voted in support of Jones; the motion failed 2-3. Though Teague said he thought the committee had put forth a qualified slate of candidates, he said he respected the work and process of the board. “The nominating committee is part of the board, so I’m going to respect the board’s decisions,” he said after the meeting, adding that the committee would continue its work. The board needs seven members to operate in accordance with state rules, but it can have as many as 11 members, according its own bylaws. With at least two more board members still needed, the application process has been reopened until April 19. Teague said after Monday’s meeting that he expects the nominating committee to meet the following week to consider new applicants. When asked if the committee could recommend a candidate to the board for a second time, Reid said that would be left to the committee.